i am going to take this opportunity to brag about a little gluten free bakery near my work :) pikanik is full of friendly faces and delicious gluten free options. i am not living a gluten free lifestyle (although arguably, i should be, if i am honouring that naturapathic test i did once) it's just so convenient to eat the crap that most grocery stores offer, and even though there are more and more gluten free options out there, it still seems like more of a challenge to live that way. 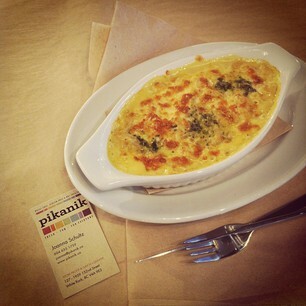 on the days when i am too lazy to pack a lunch, i wander two doors down and indulge in a delicious lunch from pikanik. joanna, the owner, is always happy to see me and katrina, (whom i call the face of the operation) knows that i swear by their trader joe's earl grey. james, the amaaazing chef, is always there with a funny quip and an astonishing, bubbly personality for a chef, (anyone whose worked in a restaurant will know what i'm talking about) which can only be accounted for as a result of this most joyous and fun work place!